511 Tactical 501590191SZ CAMS 2.0 Bag (50159) FREE SHIPPING! 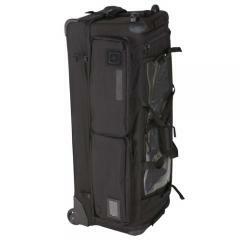 The 5.11 Tactical CAMS (Carry All My Stuff) 2.0 bag is a rugged rolling duffle, offering impressive storage volume. Its 1600-Denier nylon fabric is tough and weather-resistant, while the protective corner guards and reinforced ends ensure the pack is ideal for use in extreme weather and tactical situations. Bottom skids, over-sized wheels and self-retracting grab handles keep the pack highly mobile. Alternatively, the CAMS can be tethered convoy-style to other bags for mass transit. Rugged, lockable YKK® zippers provide secure item retention and safeguard contents from potential theft. The CAMS internal layout is highly customizable, capable of alterations made to suit any mission's loadout. Adjustable loop-sided dividers keep equipment separated and easily accessible, while the MOLLE/ALICE compatible interior allows for attachment of accessories. A separate business card and documents pocket keeps essential paperwork separate from other items and ready for retrieval. ©2002-2019 CopsPlus.com: 511 Tactical 501590191SZ CAMS 2.0 Bag (50159) FREE SHIPPING!